Silk-épil 3 is a great option for easy hair removal. 20 tweezers removes hair at the root, leaving your skin beautifully smooth. With lighting Smartlight you see every fine hair, so you will not miss a thing. Silk-épil 3 has a massage rollers that smoothly stimulate and massage your skin hair removal to facilitate and increase comfort during grooming. 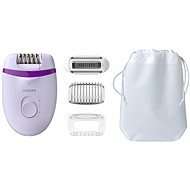 20 tweezer epilator Silk-épil 3 gently removes hair at the root for long-term results. Projections SoftLift effectively lift off hairs that are adjacent to the skin, and guide them to pinzetám. 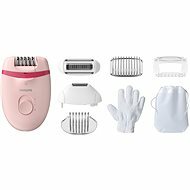 Smartlight helps you to easy control during epilation epilator and shining even the finest hairs, so that none is left behind. You can select the speed of hair removal to their own needs: Speed ? ?1 for extra gentle epilation, speed 2 for extra thorough epilation. Silk-épil 3 promises gentle hair removal through special functions with which it is common epilation even more convenient. Shaving head, Trimmer, Massage cap, Lightning Done! Cleaning Brush, Head, Attachments Done! For shipping to other EU countries visit this page BRAUN Silk épil 3-3270 SoftPerfection MILO. Für Versand nach Deutschland, besuchen Sie bitte BRAUN Silk épil 3-3270 SoftPerfection MILO Epilierer. Chcete doručit zboží do Česka? 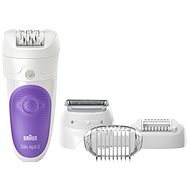 Prohlédněte si Braun Silk épil 3-3270 SoftPerfection MILO. Chcete doručiť tovar na Slovensko? Prezrite si BRAUN Silk épil 3-3270 SoftPerfection MILO. Für Versand nach Österreich, besuchen Sie bitte BRAUN Silk épil 3-3270 SoftPerfection MILO Epilierer.